I wonder if Finnish power trio The Lidocaine know the common use of their name? Lidocaine is essentially an anesthetic used locally to relieve itching, burning and pain from skin inflammations. The Lidocaine's debut The Voices and Noises of Kiling Koling is hardly music that will cause a sudden (but reversible) loss of feeling. Blending intelligent and blistering compositions, heavy riffs, and a strong sense of melody, The Lidocaine should stimulate your interest in heavy progressive rock. As a power trio you should not think Rush or Triumph, but more King's X. But even that comparison may be fallible as The Lidocaine has a greater sense of accessibility while being innovative. Maybe Blind Faith with less blues, and more speed and intrigue. While sophisticated throughout, The Lidocaine never slips into shoe-gazing experimentation. I think they're a rock and roll band at heart, just heavier. Their greatest strength may be their steady driving rhythm section with Anthony Rausku's guitar work adding a proper amount of fireworks. The weaknesses are not quite as apparent, but the vocals have much to be desired, basically slurred English (with the possible exception of Words that Smell and Call It Heavenly). Also, the ongoing compositional heaviness never really gives you a reprieve at any point except, maybe, on the aforementioned tunes. Nevertheless, The Voices and Noises of Kiling Koling is solid stuff, and certainly with your time. Listen also for these great cuts: Sunshine, All That You Ever Were, Left Overs, Call It Heavenly, and Never Break. 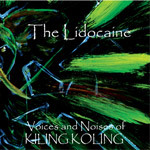 Blending intelligent and blistering compositions, heavy riffs, and a strong sense of melody, The Lidocaine's The Voices and Noises of Kiling Koling should stimulate your interest in heavy progressive rock.